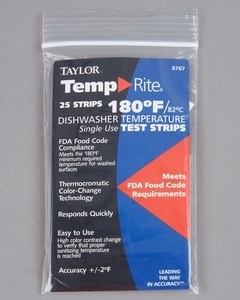 Ensure that your dish machine is operating at proper sanitizing temperatures with this Taylor 8767J test strip. 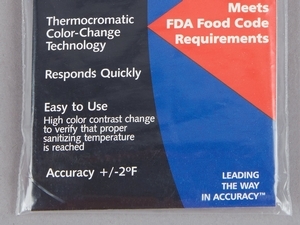 Designed to make it easy for you to double check the effectiveness of your dish machine, this test strip comes with a colored strip that changes color once it reaches 180 degrees Fahrenheit. This way, you can fasten it to your glass or dish rack, run the dish washing cycle, and then check the test strip to make sure your water temperature reached proper sanitizing temperatures. You can then label and file the test strip, which is ideal if you need documentation for a HACCP program or want to confirm proper operation of your dishwasher over time! "These are pretty good strips and the health inspector likes to see us use them to be sure the temp in correct on the dishwasher." 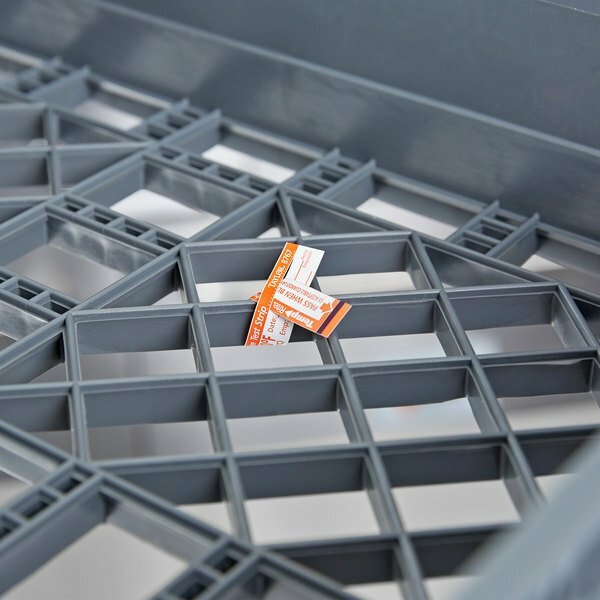 Simple and easy to use, these strips easily tie onto your glassware or dishware for a secure fit to reduce the risk of falling off during a wash cycle. Since they're so easy to fasten, you can be sure your employees will use them when required. 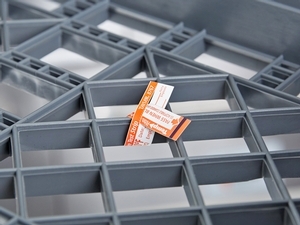 These strips are great for HACCP programs and complying with health regulations. For easy identification, the thermochromatic band changes color when 180 degrees Fahrenheit is reached. They can test water up to 180 degrees Fahrenheit and are accurate within two degrees. For best results, these test strips should not be stored in an area with high humidity or in an area where they may be exposed to water before use. Taylor products are covered by a one year warranty. Please contact our Customer Solutions team for assistance with warranty-related issues. We got these for our dish machines to temp them. They work great. We will be ordered more and i recommend them to anyone that is looking for temp stuff. These were exactly as expected. We received them as scheduled and use them regularly. They work for exactly what we need them for. Great purchase. The Taylor temprite single use dishwasher degrees test strips are excellent and make checking our washer's performance super easy. They are must to past our local health inspection and the strips are such a great price. Shipped to us very quickly. 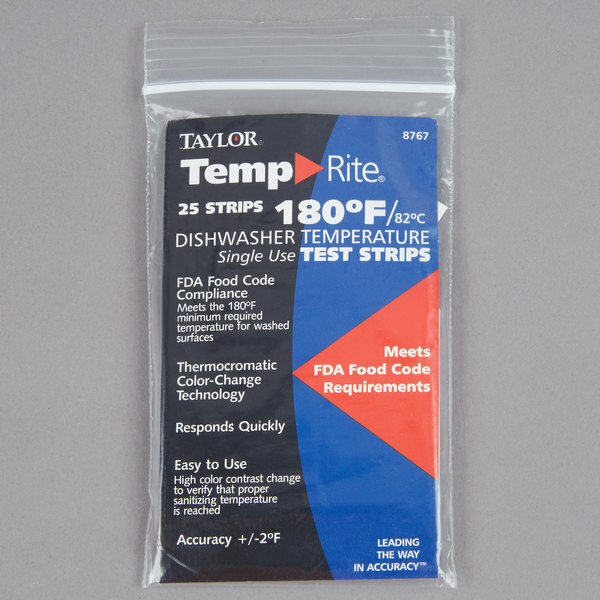 The Taylor Temprite Single Use Dishwasher Test Strip is an easy way to make sure your dishwasher is running at the correct temperature. They are single use and highly reliable. These single use dishwasher temp strips are perfect for our facility! 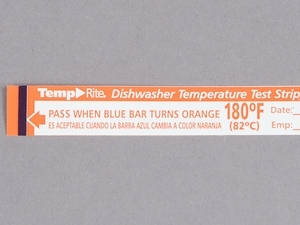 We have had issues with our dishwasher's thermometers reading correctly and this is a great item to prove out dishwasher is up to the correct temperature to sanitize our dishes. I honestly say these are accurate and the easiest to use! 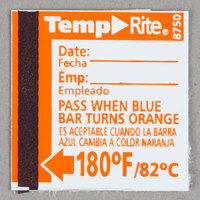 They change from black to orange when the temperature has been reached for easy reading and provide a location for the date of which the temp strip was used. I have a small commercial CMA dish machine. This worked well to test the temperature of the sanitizing cycle. Also is really inexpensive here compared to other places! Are you looking for a consistent verification method for temp tracking your dishwasher/ sanitizer ? This will do it. It's a s easy a s running the test trip in a load and observing the color at the end. These are pretty good strips and the health inspector likes to see us use them to be sure the temp in correct on the dishwasher. Accurate little strips that have helped keep the health Inspector at bay with a few of my customers. Little tricky to attach to Dish racks but after a few tries you can find the best placement. Thanks Webstaurant! !